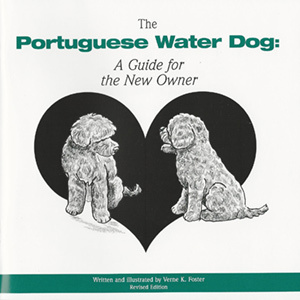 This book specifically addresses the unique behavior issues of the Portuguese Water Dog- a must for every PWD owner. By understanding the breed characteristics and genetic predispositions of water dogs, we can train to eliminate the next generation of counter shoppers, nippers and biters, Olympic jumpers, assertive sniffers and those annoying whiners and barkers who weren’t properly crate trained as puppies. Verne’s experience as a trainer and PWD owner have given her insight into the minds of the dogs we love. She teaches us to appreciate the uniqueness of the breed, while giving us valuable information on many training issues, including early socialization, crate training, jumping on people/things, housebreaking, mouthing, chewing and biting, coming when called, and much more. She also offers ideas for the continuing education of our dogs through dog sports and activities such as obedience, tracking, agility, water work, flyball, herding, and hunting, to name a few.Breeders- a must for your puppy buyers. Give those new puppy owners a head start on their energetic and intelligent puppies.